Boopsie, Inc., the leading mobile platform-as-a-service provider for libraries worldwide, demonstrated a tremendous surge of momentum in 2014. Among other achievements, the company has grown its customer base by more than 30% over the previous year. In addition to expanding its position as market leader among Public, Academic, and K-12 libraries, Boopsie now serves Corporate Libraries and Government & Military Libraries, having signed a global “Fortune 10” energy company; one of the largest cosmetics companies in the U.S.; and one of the most prestigious military-academic institutions in the world (Defense Language Institute). In addition to growing its customer base and expanding into new library industries, the company’s overall customer satisfaction is evidenced by an astoundingly high 96% renewal rate for its mobile Platform-as-a-Service. New Boopsie technologies and services shipped in 2014 include Boopsie Analytics™, which enable libraries to track downloads, unique users, queries and channel visits made in their library-branded apps from a centralized web-based dashboard. The company also launched marketing services for libraries that have increased their library-branded mobile app usage by as much as 300% for individual libraries as well as consortia and state-wide systems such as Washington State and the State of Virginia. Boopsie partnered with a number of leading digital content providers in 2014 to bring a seamless, native mobile experience to users including ProQuest, EBSCO, Baker and Taylor, Recorded Books, Overdrive, and 3M Cloud Library. Boopsie also expanded into re-selling digital content, such as Comics Plus (a digital catalog of 10,000 comics and graphic novels) and CoverCake (an in-app discovery tool for books-as-seen-on-TV). Innovative strategic technology partnerships such as Parity Computing, Inc., which provides powerful data mining, analytics, and decision-support systems for STM publishers and research institutes; Spritz, which offers proprietary advanced speed-reading technology; and LoYakk a next-generation mobile engagement platform for Fortune 500 companies that facilitates collaboration will help Boopsie serve libraries looking for a mobile strategy that will be relevant far into the future. As part of its international expansion plans, in 2014 Boopsie partnered with iGroup, the largest reseller of digital services to academic libraries in the Asia-Pacific region, serving more than 2,000 academic institutions and libraries. Furthermore, a number of industry experts joined the Boopsie Advisory Board in 2014 including Fareed Adib, Global Head of Android Partnerships at Google; Dr. David Clementz, former CIO of Chevron-Texaco; Dr. Michael Housman, Chief Analytics Officer from Evolv, Inc., and other technology industry leaders. Boopsie, Inc. is the industry-leading mobile platform-as-a-service (PaaS) provider for over 4,000 library locations worldwide. Boopsie’s library-branded mobile apps are affordable, easy to deploy and maintain, and enable libraries of all types and sizes, including academic, corporate, public and special, to quickly acquire new users and increase circulation. Boopsie’s mobile apps are fully hosted and maintained by Boopsie’s U.S. based customer service organization and are designed for Android, iOS, Windows Phone 8, Windows Mobile, Windows 8, Kindle Fire and even Blackberry platforms. Boopsie enables 24/7 remote library access via the user’s device of choice. Boopsie also sells subscription services including a “Books-as-Seen-on-TV” subscription, a digital catalog of comics and graphic novels and a speed-reading technology. Visit Boopsie.com for more information about mobile apps for libraries. Rising consumer confidence and lower unemployment are likely to bring out the holiday spirit in economically conscious shoppers this snowy season. IBISWolrd projects that total revenue generated by holiday spending in December will increase 2.0% this year, totaling $ 70.9 billion, This is a sharp contrast to 2013, when a shortened holiday calendar, early Thanksgiving and October government shutdown dampened consumer confidence and spending. However, before dashing through the snow for the best deals, lackluster sales over the Thanksgiving holiday suggested that retailers might be in for a slightly slower season than expected. Business efforts to push promotions and discounts earlier this year may backfire, as internet and mobile shopping reduces the need to rush out and find good offers early. More consumers will check prices online and shop for the best bargain, leaving retailers to compete with one another by lowering their prices. Overall, despite improving economic conditions, competitive pricing and savvy customers will keep sales from breaking records. Gifts represent the single-largest expenditure during the holidays, generating 77.2% of total revenue. In 2014, IBISWorld forecasts this category to grow 1.8% to $ 54.8 billion. Although the economic climate has trended upward since the recession, consumers are likely to continue to hold back on extravagant gifting. According to IBISWorld Industry Analyst Andy Brennan, “purchases of gifts, including electronics, toys, clothing and personal care and cosmetic items, are expected to rise higher than their disappointing levels in 2013, but retailers should not expect dramatic increases.” Similar to last year, well-timed releases of new video games, consoles, tablets and smartphones will help drive growth for the electronic category, which is anticipated to increase by 2.1% from 2013 levels. Personal care and cosmetics are also expected to see an increase, as consumers take advantage of flexible online shopping options and promotions. Sales of cosmetics are forecast to increase by 3.3% to $ 5.7 billion this year. Toys and clothing are also anticipated to increase, by 2.4% and 2.3%, respectively. However, heavy discounting will stifle growth in these two categories, as consumers scour the internet for better deals. Meanwhile, jewelry sales and gift cards are forecast to demonstrate less-spectacular growth this year. Consequently, both categories are anticipated to increase by only 0.2% over 2014. Revenue generated from food and alcohol purchases is expected to grow at a slightly faster rate than total holiday revenue this year, increasing 2.3% to $ 6.3 billion. “Food prices have outpaced the overall rate of consumer prices in 2014 due to rising farming and transportation costs and higher global demand,” says Brennan. However, the recent decline in the world price of crude oil will enable more long distance travel and allow consumers to spend the holidays with family and friends. Total spending on decorations is projected to rise 4.3% this year to $ 6.5 billion. Seasonal winter decorations, including wreaths, ornaments, nativity sets and nutcrackers, account for nearly two-thirds of total annual decorations spending. Although the number of consumers celebrating holidays during this time of year has declined slightly over the past five years, the average amount spent per person has increased steadily as consumers have opted to decorate earlier. Selling seasonal decorations is now a big business, as the holiday season has become increasingly commercialized. Spending on greeting cards, on the other hand, is anticipated to decline in 2014. Technical Help in Engineering and Marketing (T.H.E.M. ), a leading North American provider of single-serve flexible packaging solutions, will showcase the Sanko ZERO 1 high-speed liquid and paste packaging machine at Pack Expo 2014, November 2-5, South Hall, Booth 4107, Chicago, IL. Capable of running at speeds over 2300 packages per minute, the ZERO 1 delivers over twice the output rate of traditional form-fill-seal pouch filling systems without leakers. Ideal for a variety of single-use liquid and paste products such as food condiments and salad dressings, this high-performance liquid filling machine features incredible flexibility. Unlike other liquid filling machines, the ZERO 1 allows fast and easy change over to accommodate different package sizes. Changing package length, filling volume, perforation and cut position can be made through simple operator commands on the LCD touch panel display. The Zero 1 is a welcome solution for liquid products that are prone to generate bubbles during the form-fill-seal process – such as oil and vinegar – employing a proprietary process in the sealing rolls. This unique solution augments the sealing function by providing repeatable and robust seals, enhancing both machine performance and product quality. Because there are minimal fluctuations of sealing temperature, the ZERO 1 is able to maintain seal integrity at high speeds. In addition to the touch-screen operator interface, standard features of the Zero 1 include the ability to run registered film, a splice detector, an end of film sensor, a broken film sensor, an I-Notch device, air expelling guide rollers, automatic film tracking, safety interlocks, and a double roller sealing system. Among the machine’s available options are: CIP, a perforation cutter, saw tooth end cut pattern, a divider of packages by preset number, a film path enclosure, four-side sealing, a system to accumulate packages by preset number, intricate top seal patterns, and clearance adjusting knobs for vertical and second horizontal sealers. Another key option offered by Sanko on the Zero 1 is a web splice feature that eliminates the need to stop production when changing rolls. T.H.E.M. will also showcase several additional packaging innovations at Pack Expo 2014, including the Snapsil® easy-open container, the Zipbox® resealable box, single use pouches, and flexible stick packs, the technology for which T.H.E.M. is best known. . The Snapsil semi-rigid container, developed by Australian-based Snapsil Corporation and used for single-serve consumer products, features a patented audible “snap-opening” function that allows consumers to open the package with one hand. Developed in conjunction with global technology and commercialization partner Zip-Pak, a Division of Illinois Tool Works Inc. (ITW), ZipBox combines the stability of a carton with the convenience of a resealable flexible package, eliminating the need for a separate inner liner. This unique package meets the emerging need for better cube utilization, shipping and energy efficiencies, and enhanced consumer convenience. T.H.E.M. will showcase its complete range of single use pouch and stick packaging solutions along with representatives from Sanko Machinery Co., the largest manufacturer of stick packaging machinery in the world. T.H.E.M.’s NJ-based facility provides contract manufacturing and packaging services for a number of global consumer brands and retailers in the form of flexible stick packs, pouches and other single-use flexible packaging formats. In addition to food and beverage products, the company supports nutraceuticals, pharmaceuticals, personal care products, and energy supplements. The company’s form-fill-sealing operations accommodate both liquid and dry products, and are designed to take customers from initial trial run, to scale-up, to full commercial production, in addition to supporting product line extensions and limited edition offerings. T.H.E.M.’s facility is FDA-registered, Kosher and USDA Organic certified, and also certified to package dietary supplements. Recently the plant obtained Safety Quality Food (SQF) Level 2 Certification. In addition to contract packaging, the company also provides R&D and engineering services, as well as flexible packaging machinery. Technical Help in Engineering and Marketing (T.H.E.M.) was founded in 1973 as one of the first providers of innovative packaging solutions in North America. The company is best known for commercializing Sanko Stick Packaging in the United States. Working in conjunction with select packaging and equipment manufacturers, T.H.E.M. offers a comprehensive array of packaging solutions designed to take brands from initial concept to full-scale national or global production. T.H.E.M. has a fully operational, on-site R&D center located at its Marlton, NJ headquarters, with pilot production, scale-up, and full-scale contract packaging capabilities. For more information on T.H.E.M.’s flexible packaging machinery and contract manufacturing services, please visit: http://www.them.net. This timely recognition coincides with several articles over the summer from eminent journals as diverse as The Telegraph and Hello magazine, discussing how the state of our teeth directly affects our confidence to get on with our lives. In fact a recent survey (BUPA 2012) showed that a remarkable 63% of people believe having bad teeth can prevent a person from finding a partner. Over half of respondents believed that good teeth can help an individual get a better job, while almost 50% believed nice teeth help people make more friends. Researchers from Deakin University in the US also found that poor dental health increased the likelihood of a person being depressed. None of this, of course, comes as any surprise to the nation’s dentists. The cosmetic dental industry has grown dramatically in recent years, with the value of cosmetic dentistry increasing by 34% between 2009 and 2013. Award-nominees Visage believe that dental implants will become the treatment of choice for patients who have lost one, several or indeed all of their natural teeth. Dental implants can be used to support a single crown, a bridge containing two or more teeth or a denture covering the entire upper or lower jaw. The technology involved has progressed at such a rate that implants are now easier to place and last much longer than in the past. On top of this, cosmetic dentistry is seen as a much more affordable and socially-acceptable solution to serious teeth problems. And, as the experts at Visage are keen to point out, treatment completion times have reduced dramatically, making it easier for patients to improve their looks without any major impact on their lives. The results for the 2014 Dentistry Awards will be announced in December. In the meantime you can learn more about Visage’s previous nominations and awards at their online Awards Gallery. The Aesthetic Surgery Journal (ASJ), a peer-reviewed international journal focusing on scientific developments and clinical techniques in aesthetic surgery, was recently ranked the number one journal in aesthetic plastic surgery and second in plastic surgery overall, with an Impact Factor of 2.034 according to the 2014 Thomson Reuters Journal Citation Reports®. ASJ is the official publication of the American Society for Aesthetic Plastic Surgery (ASAPS). The Journal Citation Report rankings measure the Impact Factor, the average number of times articles from the journal published in the past two years have been cited. Since 1975, the Impact Factor has been relied upon as an indicator of professional journal relevance and importance. The Aesthetic Society Journal is the official publication of the American Society for Aesthetic Plastic Surgery. It is published eight times per year and contains scholarly articles on new advances and procedures pertaining to cosmetic medicine and the plastic surgery industry. ASJ was indexed with MEDLINE/PubMed in 2008 and with the Thomson Reuters Journal Citation Report (JCR; formerly ISI) in 2011. It is the official English-language journal of many major international societies of plastic, aesthetic, and reconstructive surgery representing South America, Central America, Europe, Asia, and the Middle East. It is also the official journal of The Rhinoplasty Society and the Canadian Society for Aesthetic Plastic Surgery. The Journal also includes Continuing Medical Education articles and exams. 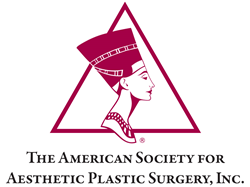 The American Society for Aesthetic Plastic Surgery (ASAPS) is recognized as the world’s leading organization devoted entirely to aesthetic plastic surgery and cosmetic medicine of the face and body. 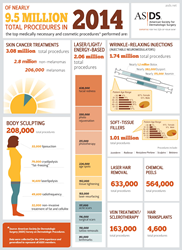 ASAPS is comprised of more than 2,600 plastic surgeons. Active Members are certified by the American Board of Plastic Surgery (USA) or by the Royal College of Physicians and Surgeons of Canada and have extensive training in the complete spectrum of surgical and non-surgical aesthetic procedures. International Active Members are certified by equivalent boards of their respective countries. All members worldwide adhere to a strict code of ethics and must meet stringent membership requirements.